This book was given to my for my honest review. 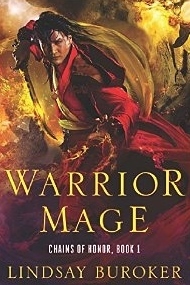 This was set in the Emperors Edge world ( If you haven’t read that pick it up FANTASTIC series!!) Also it has to do with the characters from the Salt and the Sword series that she wrote and it has mentionings and appearances of other characters from other books set in the same world. Warrior Mage can be read as a stand alone though. We are introduced ( or reintroduced ) to Yanko a modest young man who at the beginning is taking his warrior mage entrance exam for a school. He has talent but towards the end of his exam he decides to show off and well ends up back in the family salt mines. While in the salt mines a catastrophe happens and Yanko escapes with his friend to go back to his village in which he has found pillaged,scorched and the villagers as well as his father gone. He ends up finding his brother that is in the military and has with him a letter from a Prince Yanko befriended in the Salt and Sword series in which sets him off on a course of adventure and mayhem. He takes his friend a female by the name of Lakeo with him and a mysterious Turgonian named Dak who owed him a favor. He comes across his lost free spirited crush and some interesting cast of characters all while being chased by a mage hunter and a seriously angry Warrior Mage foe. The book was wonderfully fast paced and as in all her books the plot was complex and interesting.The characters were fun, smart and some of their pasts mysterious. Every time I had to sit it down I was looking forward to the moment I could pick it up and continue it. This book can be read as a stand alone. The ending is quite the cliffhanger!! I’m excited to continue this adventure with Yanko and his friends.